Czechs are largely terrible drivers, pure and simple. It is not that they can’t drive, it is just that they interpret the highway code far more liberally than they ought to. Speed limits will usually be ignored, changes of lane can be done too quickly and tail-gating is commonplace; thus, the rate of accidents are around twice what they are in Western Europe and the US. The problem lies in being able to enforce the traffic rules: municipal and local governments have just allowed much of the violations to go unchallenged. Nonetheless, following some especially bloody years recently and lobbying from the E.U., the authorities now say that they’re making a move, at last, to crack down. They are proposing an increased presence of traffic police to monitor intersections and motorways so we will just have to see if this situation gets better. 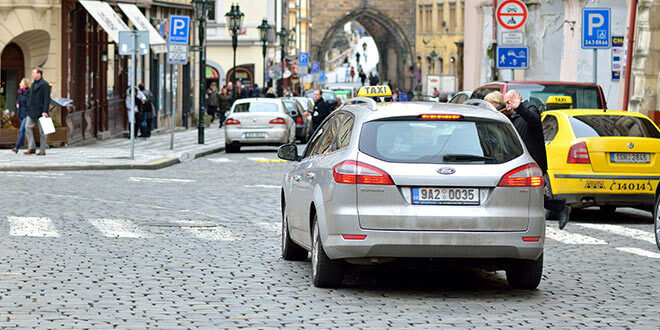 Czechs are usually in a huge rush on the roads—even Prague’s slender one way streets can often feel like a race-track and, if you are travelling slower than the driver behind you desires, you will be glared at and shot past as though you had committed a heinous crime. 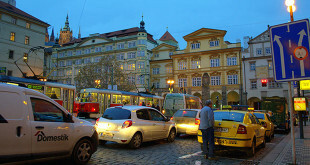 Trying to drive in Prague is especially hazardous; because the city is just not designed for cars. Most of its’ roads are one way and are broken up haphazardly as lines for pipes get replaced and many are also cobble-stoned. Once these roads get wet, you need to drive with great care because they will slip away from underneath you in an instant. Many major roads have lines for trams also and some of these run through the middle or down the sides of the roads, although lots of tram lines just share one lane with the cars. 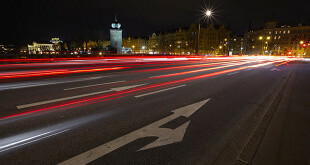 The building of some large cross-city connecting roads and some other outer motor-ways in Prague is, at least, starting to assist with the easing of much of the city’s congestion. Take care during the normal rush hours—usually 06:00 to 09:00 and 15:00 to 18:00. Patterns of traffic in Prague are a perpetual mystery—some days it is very smooth and other days it is so dire that you might as well just abandon your car and take the tram. The speed limits in cities and towns (including Prague) is kmph unless stated otherwise. On double-lane roads in the country, it is ninety kmph and on quadruple-lane roads (marked with yellow on your road atlas) and on motorways it is one hundred and ten kmph, although many drivers usually just ignore all of this. If a law enforcement official does pull you up for a traffic offence, you will have to pay a cash fine straight away. An appeal for discretion might work and you might be able to convince him or her to reduce the fine a bit, but you will still have to pay your fine in cash. Ask him or her to assign you a valid ticket to ensure that your money does not just go to them personally—the temptation for the police to do this is very strong. Drinking then driving is a major offence in the Czech Republic and the police will frequently do random checks on the spot during the night-time. The slightest hint of any alcoholic substances showing up on a breathalyser test will be sufficient to convict you—not even a single drink is allowed and the penalties can be anything from a 10000 CZK fine to the confiscating of your driver’s licence to incarceration.